This years’ Interclub Tournament, hosted by Mrs. Parker IV, brings together GTUK members from Beccles, Bungay, Burton Latimer, Grange Park, Northampton, Raunds, Wellingborough and Wollaston for what’s sure to be a fun day out for everyone. This a great introduction to competitions for new and younger students. Whether you want to compete or just watch, everyone is welcome, why not bring along your mums, dads, grandmas, grandpas, uncles, aunts, brothers, sisters and friends ! It’s going to be a great day… so just come along. The Northampton venue has changed this year (a map has been provided to your instructor). There is an on site café serving hot drinks and food. It’s a great chance to represent your club and get to know others like you, who are all Taekwon-Do Martial Artists. You may even take home a medal or two! Let your instructors know you are interested. Point / Continuous Sparring (age & grade dependent). • Hands, Feet and Head Guard. • Groin Guard (compulsory for men and boys). Pitsford Road, Moulton, Northampton, NN3 7QL. 29 medals in total were achieved by 19 fighters in all age groups, pee wees (under 12) included superb double gold for Jayden Howgate in patterns and special techniques and gold for Jack Sutton in his patterns division. Jed Baddour showed exception sparring ability to win his division in emphatic style with 3 head kicks awarded to be given the gold. Isaac Slater also battled hard to a bronze in sparring but achieved an excellent silver for patterns in a large division. Juniors (13-17) achieved a great haul of medals with Imogen Suttons gold for sparring and bronze for patterns and Daisy Whymarks gold for patterns and bronze for sparring being real highlights as it was their 1st competition. Bailey Aldrich gained gold for patterns and silver for sparring which was a fabulous achievement as he had stepped up to juniors being a tall 12 year old! Kelsie Dyer showed great courage to win gold for patterns and bronze for sparring whilst fellow Bungay High School student James Thurston won silver for patterns. Evelyn Brooks won bronze for patterns and silver for sparring to round off a superb showing for the teenagers. 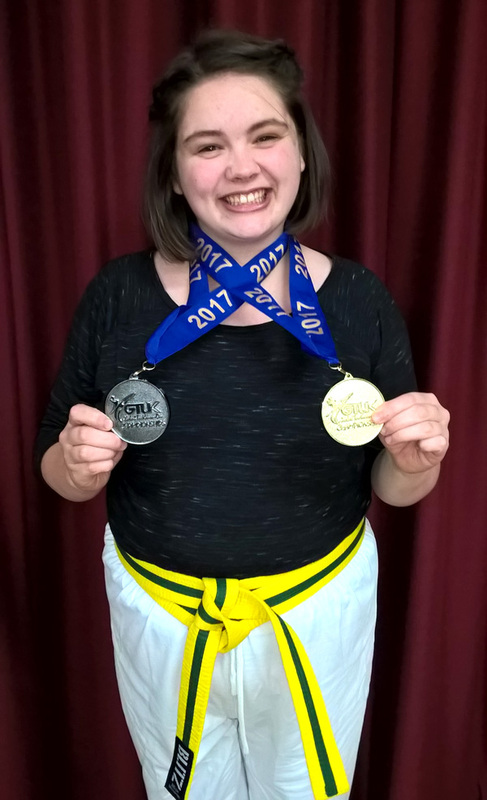 Adults (17+) included a fantastic double gold for Jade Howgate in sparring and patterns beating team mate Poppy Whymark to a creditable double silver, as she is only just in the adult section. A great gold for Jason Drake for black belt destruction went with his silver medals for both patterns and sparring whilst Gary Wheeler won double bronze medals in his 1st competition as a black belt! Barbara Mazza gained a silver in the black belt ladies patterns with Paul Chapman gaining a silver for patterns and bronze for sparring in the coloured belt male section. Several other competitors competed and supported superbly with Colby Aldrich battling to 4th place in the pee wee sparring, whilst Jack and Jess Chapman competed really well but finished just outside the medal positions, both losing out to the eventual category winners. Jacob Burden did a superb job helping to referee for the 1st time as a black belt and Benjamin Burden acted as junior coach. Steve King The area 6th degree and senior said “Bungay & Beccles achieved a fantastic 60 points and considering the distance travelled for competitors the amount of medals won is a real testament to Eastern Taekwondo”. 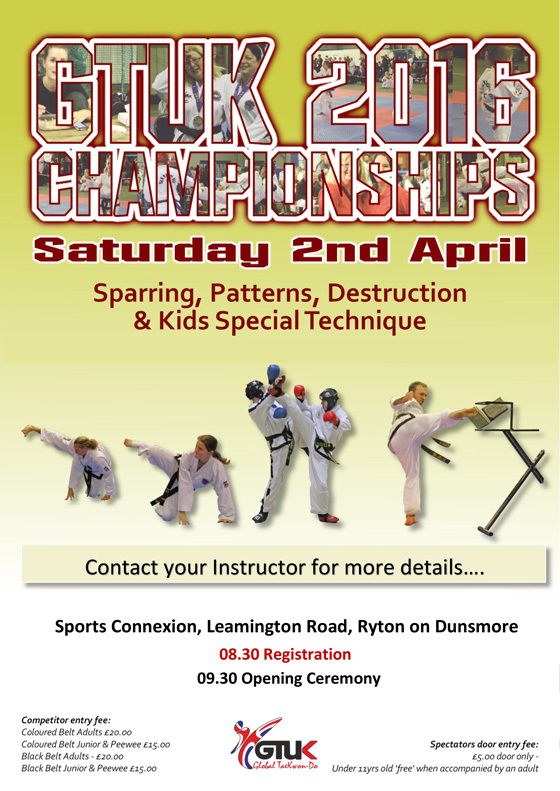 The Instructors of Borough Tae Kwon Do would like to invite you to this year’s annual Northants Interclub Tournament! Sunday 4th February will see the Wellingborough Club host this year’s annual Northants Interclub Tournament this year’s interclub Tournament brings together members from Grange Park, Wellingborough, Wollaston, Northampton, Raunds, Beccles and Bungay for what’s sure to be a fun day out for everyone. There will be patterns and sparring divisions, as well as destruction categories available to adult students. As always, the clubs will be competing for the Interclub Trophy. An awarded to the club with the most successes throughout the day. You can enter as many of the events for your grade and as age as you would like. •Hand, Feet and Head Guard. •Groin Guard (compulsory for men and boys). Whether you want to compete or just watch…everyone’s welcome. Why not bring along your Mums, Dads, Grandmas, Grandpas, Uncles, Aunts, Brothers, Sisters and Friends? It’s going to be a great day…so just come along. If you have any questions, or you want to order safety equipment, just ask your Instructor and they’ll be able to help. Don’t miss this day…it’s a great chance to meet and get to know others like you, who are all Tae Kwon-Do Martial Artists. Hope to see you all there. Venue: Weavers Sports Centre, Weavers Road, Wellingborough, NN8 3JQ Costs: Competitors £8, Spectators £3 – to be paid on the day. There is no entry form for this event, all entries will be managed on the day! The aim of the England Development Squad to allow students to attend additional training with other like minded students and develop technique, confidence and ability, to be the best they can be. SQUAD TRAINING sessions cover sparring technique, patterns, power breaking, special technique, as well as team patterns, and competition scenarios. 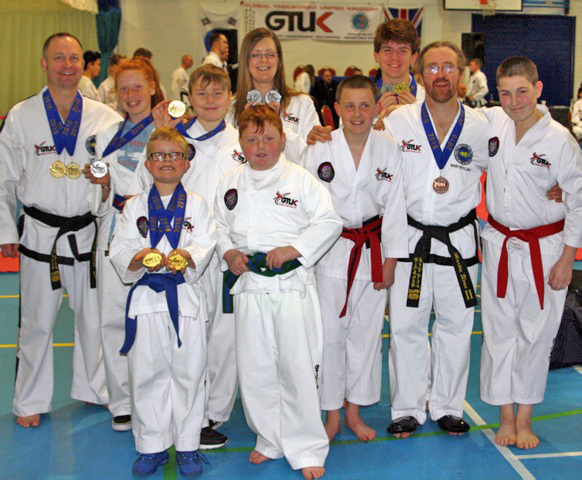 SQUAD TRAINING is open to all GTUK students aged 8 and over, it is not by selection or invitation by GTUK Coaches; students just need approval from their Instructors prior to attending. As Coaches we actively encourage Instructors to attend themselves, and to send their students, however we must point out that squad training is in addition to club training, not replacement. We can accept children occasionally under the age of 8 by prior agreement by the coaches, and their instructor. Cost of squad training is £7 for 3 hours, and we will require to see proof of insurance upon registration, and we can ask for proof at any point during your training. Next training session is Saturday 27th January, between 2pm – 5pm, as it is the first training session of the year we will require the 2018 registration form to be completed. Please DOWNLOAD, print, complete and bring to the session, with your registration form. Students should wear white doboks, and current belt, and MUST bring along a full set of sparring equipment; headguard, closed fingered gloves, and footpads. Male students should wear groin guards. The session is intended to push your own individual limits, (we’re all different, and you know your levels), so we recommend not training when injured, and to always bring plenty of fluids. 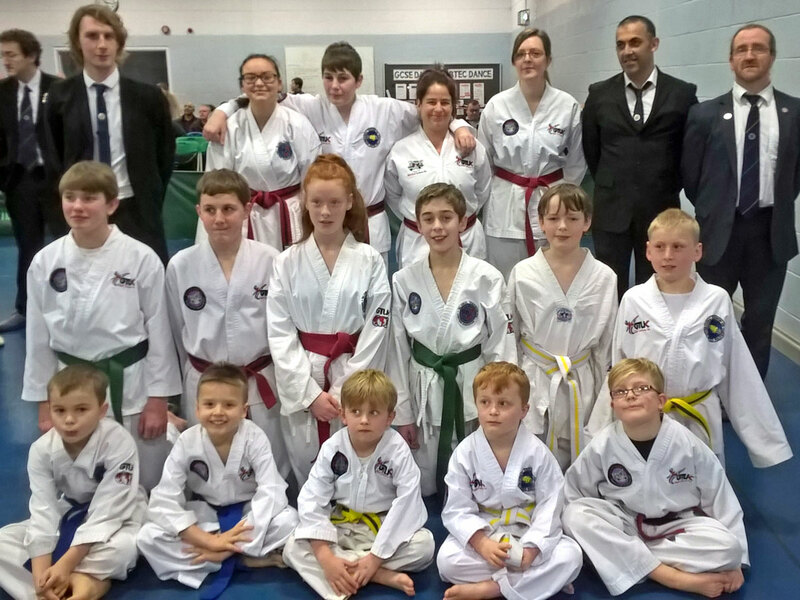 There were some great results from Bungay Taekwondo students at the weekend when 12 competitors travelled 160 miles to Coventry in order to compete in this year’s British GTUK Championships. Toyota Smith achieved a fantastic gold in the sparring and silver in the patterns in her first ever tournament, fighting in the adult ladies 10-7th kup category, whilst Jade Howgate gained two silver medals in the adult ladies 3-1st kup section. Neil Genn-Bromley fought hard to achieve a bronze in the adult male 10-7th kup competition. Bungay High school Year 10 student Kelsie Dyer surpassed her own expectations to win silver for patterns and bronze for sparring in the junior girls 6-4th kup category and Liam Everett fought extremely hard for his silver in the junior male 3-1st kup division. 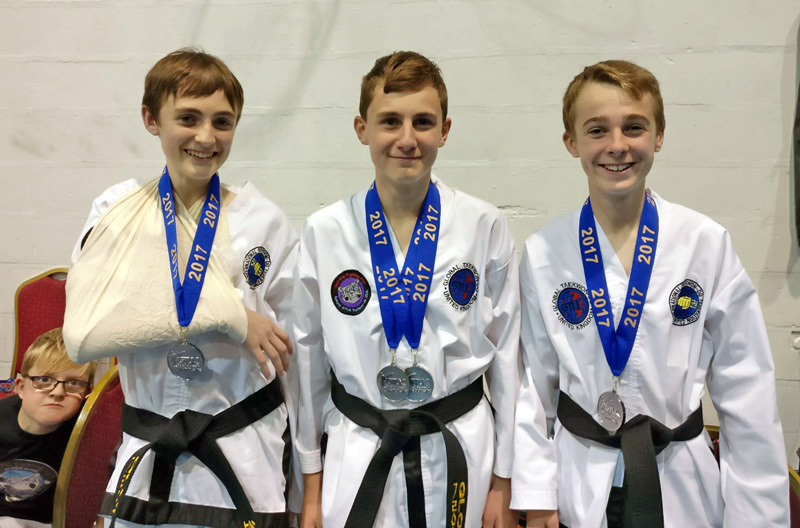 His brother Christian Everett performed superbly in the junior black belt patterns to get his 1st silver medal as a black belt and then followed this up with an even greater award in the tag team challenge. Christian fought alongside fellow Bungay High School students, Jacob Burden and Adam Fuller in the hugely competitive black belt tag team sparring event which is a truly amazing spectacle to watch and they astonished themselves by finishing as silver medallists, although, it was incredibly hard fought and Jacob ended up getting checked out at hospital for a suspected broken arm, fortunately this turned out to be a badly buckled radius. Isaac Slater was truly unlucky to lose a bronze medal match on a technicality after fighting his way through several tough rounds in the pee wee 3-1st kup cohort, whilst Colby Aldrich and Jayden Howgate competed well but missed out on the medals. 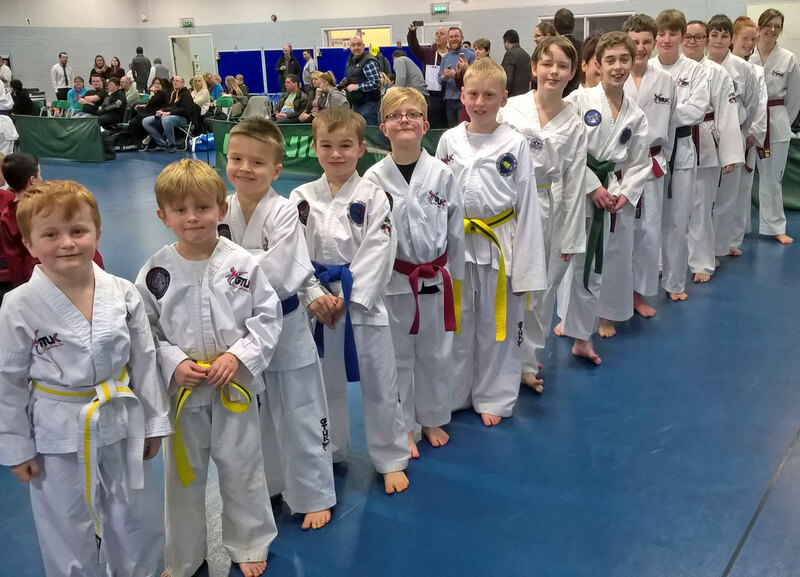 The club can now focus on getting ready for the last grading of the year satisfied with some great performances in this year’s competition circuit. It is still possible to start training with Clinton Gillett who is a 5th Degree international instructor, world silver medallist from 2000 and current UITF veteran champion. The club trains at Bungay High School on Tuesdays and Thursdays from 7pm and welcomes students of all abilities from the age of 6 to 60 and beyond please contact the school on 01986 892140 for further details or pop along for a free taster lesson. The Eastern Area Inter-Club tournament took place in Wellingborough this year and Bungay Taekwondo Club with support from Beccles Taekwondo Club battled to a very creditable 3rd place in the region with some great individual performances which was excellent considering the competition was so fierce. 24 medals in total were achieved by 18 fighters in all age groups, pee wees (under 12) included silver for Jayden Howgate in his patterns division and silver for Jack Sutton in his sparring division. Juniors (13-17) achieved a great haul of medals with Tegan Brown’s and Christian Everett’s golds for patterns and silvers for sparring being a real highlight, whilst Ewan Lutz gained gold for sparring and bronze for patterns, James Thurston won silver for patterns and bronze for sparring. Robin De-Berniere-Smart did really well to win silver for sparring and bronze for patterns in his first ever competition whilst Liam Everett won bronze for sparring. Adults (18-48!) included a great double gold for Jade Howgate in sparring and patterns, gold for Barbara Mazza (Beccles) in the patterns and silver in the sparring and a superb gold for Club Assistant Instructor Martin Sloan in the black belt patterns. Jack Handley achieved a fantastic gold in the black belt sparring and bronze for patterns whilst Jason Drake (Beccles) gained silver for black belt patterns and bronze for sparring. Chloe Florido achieved silver for patterns and sparring in her division. All Red/Black belts please make this session, as Jeegoos are a very important part of your training. This is a great little tournament especially for those wishing to take part for the 1st time. All students welcome, patterns, sparring and adult destruction for green belt and over. Grand Master Oldham and the Tournament Committee are honoured to invite and welcome you to our GTUK 2016 Championships. We are working hard to ensure that our tournaments are a memorable and enjoyable experience for both competitors and their families, bringing together members of the GTUK, young and old from all of our regions of the UK. GM Oldham and the Tournament Committee would like to take this opportunity to thank you and your competitor(s) for the continued support at the GTUK championships. 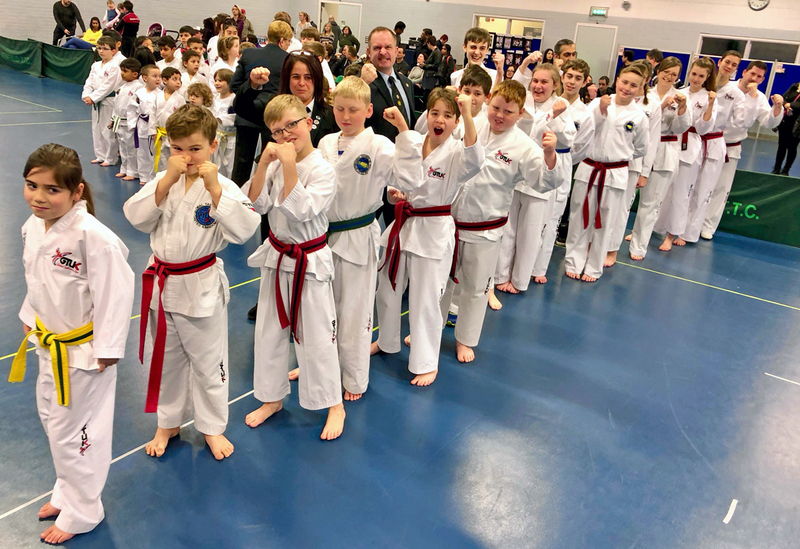 The individual’s competition is open to students of all ages and levels of Taekwon-Do, giving each and every student the opportunity to take part in competitive patterns, sparring and where age appropriate destruction. 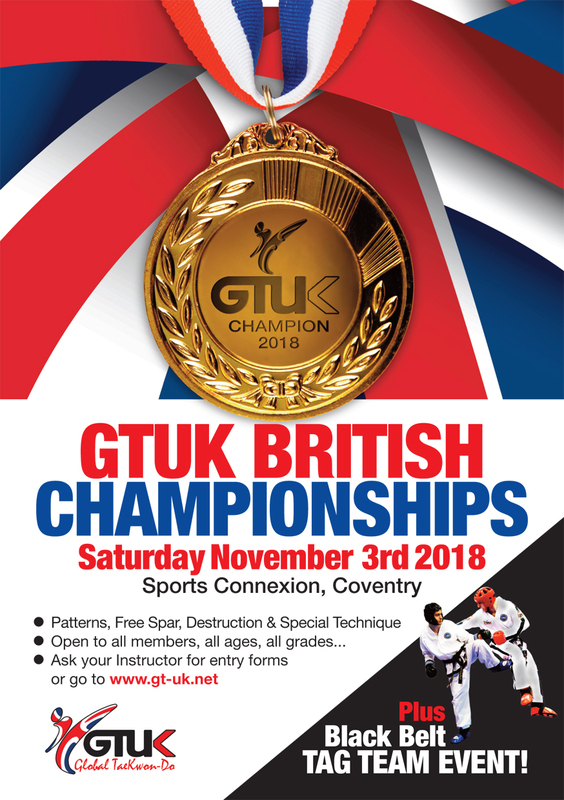 All students are placed into categories according to their age and belts to give everyone a fair chance to compete to become GTUK National Champions. The venue has free parking and there will also be stands to purchase GTUK merchandise, photographs and refreshments on the day if desired. There will also be an After Champs Party at Sports Connexion, Ryton at 7:30pm with a fancy dress “olympic” theme. There will be a bar, disco and free buffet served around 8pm; tickets are available to be reserved via your Instructor. Don’t miss this opportunity to take part! Please request an entry form from your Instructors and return with fees to your Club secretary. Entry Fees: Adults £20, Juniors £15, Spectators £5 – under 11s free when accompanied by a paying adult. Come and give it a try and show the UK what Bungay can do! 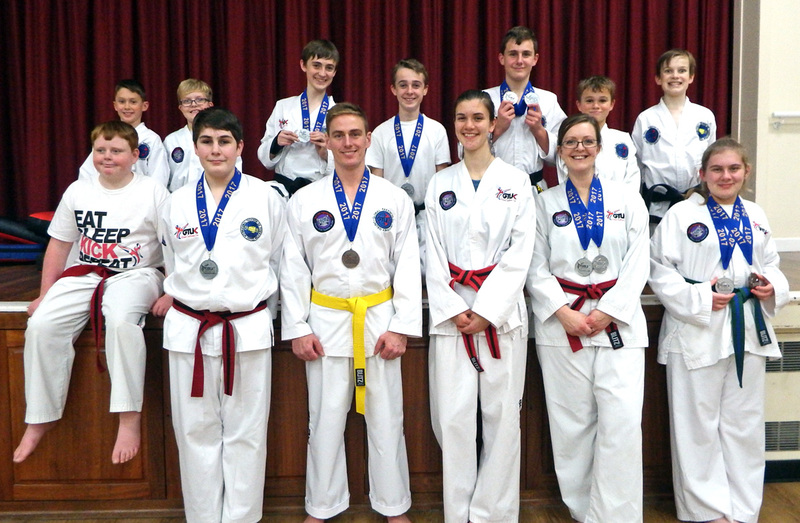 The Bungay club entered a squad of 10 competitors across all age categories and came back with a total of 13 medals between them, with 6 Gold and New British Champions! This is a 300 mile round trip from Bungay, so this makes it even more exceptional to travel all that way and come back with such a great medal haul. Colby Aldrich and Christian Everett competed bravely but narrowly missed out on the podium. Grand Master Oldham and the Tournament Committee are honoured to invite and welcome you to our GTUK 2016 Individual Championships. We are working hard to ensure that our tournaments are a memorable and enjoyable experience for both competitors and their families, bringing together members of the GTUK, young and old from all of our regions of the UK. Grand Master Oldham and the Tournament Committee would like to take this opportunity to thank you and your competitor(s) for the continued support at the GTUK championships. 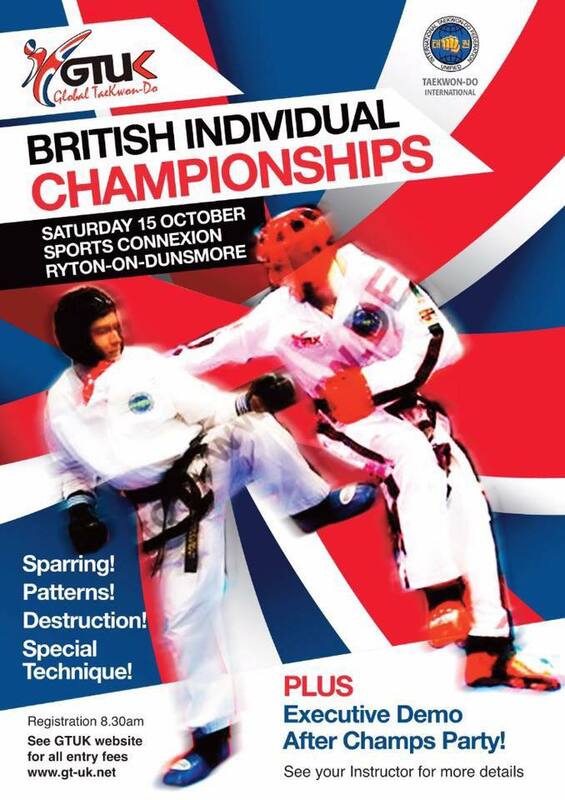 This individual championship is open to students of all ages and levels of Taekwon-Do, giving each and every student the opportunity to take part in competitive patterns, sparring and where age appropriate destruction. 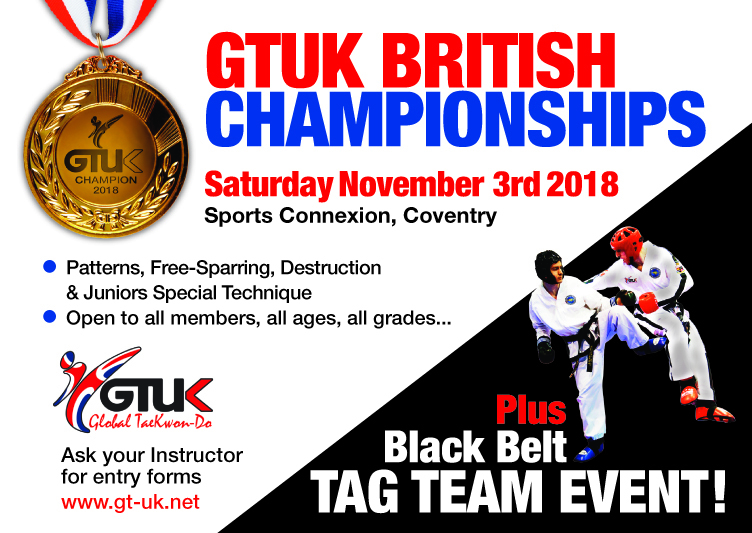 All students are placed into categories according to their age and belts to give everyone a fair chance to compete to become GTUK National Champions. The venue has free parking and there will also be stands to purchase GTUK merchandise, photographs and refreshments on the day if desired. Please complete the form below and return with fees to your Instructors by 26th March 2016. Please click link below for PDF file of tournament information and entry form.